Where in the World is Rotodactylus? Rotodactylus ichnites (Peabody 1948, Lower Triassic, Moenkopi Formation, Arizona, Utah; Grès d’Antully Formation, France, Middle Triassic Haizer-Akouker Unit at the Belvédčre (Bkherdous) locality in Algeria; Fig. 1) are distinguished from all others by the impression of pedal digit 5 far behind the other asymmetric digitigrade toes. 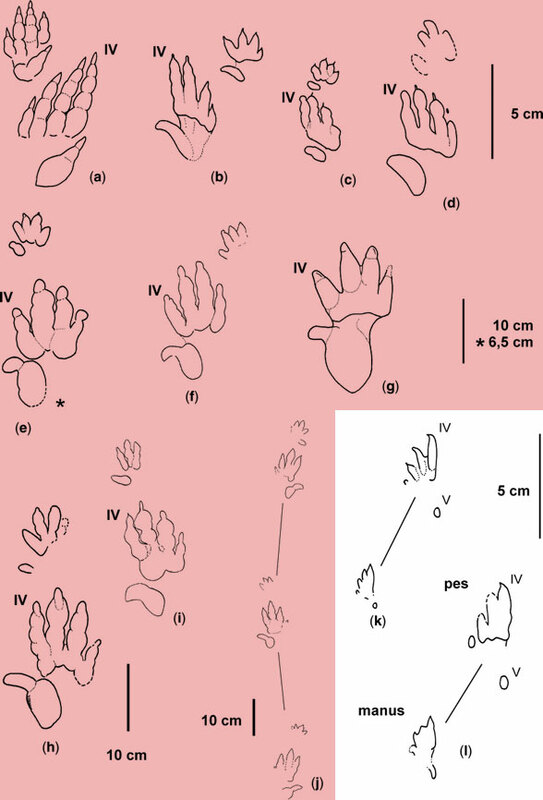 Peters (2000) matched Rotodactylus tracks to basal fenestrasaurus, including Cosesaurus (Fig. 2). We can also include a Cosesaurus sister, Langobardisaurus, as a possible trackmaker, following several days of Langobardisaurus news here and here. We can probably also include Pteromimus and Amotosaurus, more sisters to Langobardisaurus and Cosesaurus. Figure 1 Cosesaurus and Rotodactylus, a perfect match. Elevate the proximal phalanges along with the metatarsus, bend back digit 5 and Cosesaurus (left) fits perfectly into Rotodactylus (right). Here (please check this link) is a good Rotodactylus track along with a model of a Cosesaurus-like hypothetical trackmaker. Note pedal digit 5 does not include an ungual imprint, as the model indicates it should and Peabody (1948) noted. No, the pedal 5 imprint is a smal round impression, the sort made by the impression of the dorsal side of a flexed interphalanageal joint, as in pterosaurs. Figure 2. 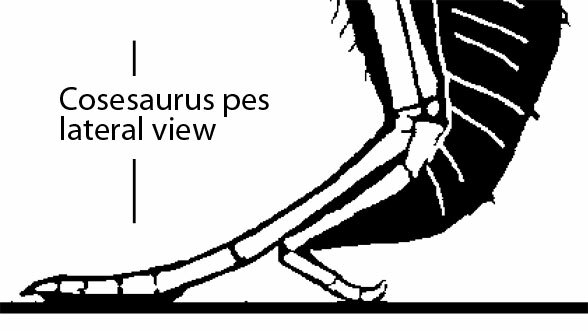 Cosesaurus foot in lateral view matches Rotodactylus tracks. The center of balance is over the anterior toes. Digit 5 was more like a kickstand bouncing and flexing with each step but distant from the weight-bearing digits. Figure 4. The Triassic World with Rotodactylus areas in pink. Figure 3. Rotodactylus in white along with other Triassic tracks in red. 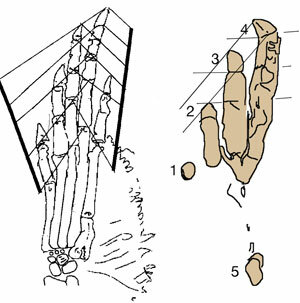 Even the manus of this specimen extended posteriorly, but also notice, you see the tip of the digit, unlike the pes. Here Lagosuchus nests as a theropod with pedal digit 3 far exceeding digit 4 and digit 5 was absent a far cry from the ichnite Rotodactylus. Cosesaurus and Langobardisaurus are better matches. Paleontologists see Rotodactylus as digitigrade and consider it archosaurian, close to dinosaurs. They also note that digit 4 is longer than digit 3, which occurs in lizards, proterosuchians and protorosaurs, far from dinosaurs. The presence of pedal digit 5 also knocks archosaurs, out of contention. What we’re looking for is a match on all counts. Such a match occurs in basal fenestrasaurs. Rotodactylus tracks have been found from the US southwest to central Europe and Algeria (Fig. 3). That’s a large area and it increases hope that more Pteromimus/Langobardisaurs/Cosesaurus-types will be found someday as fossils in this zone. Brusatte SL Niedźwiedzki G and Butler RJ 2011. Footprints pull origin and diversification of dinosaur stem-lineage deep into Early Triassic. Proceedings of the Royal Society of London, Series B, 278, 1107-1113. Ellenberger P 1970. Les niveaux paléontologiques de première apparition des mammifères primoridaux en Afrique du Sud et leur ichnologie. Establissement de zones stratigraphiques detaillees dans le Stormberg du Lesotho (Afrique du Sud) (Trias Supérieur à Jurassique) [The paleontological levels of the first appearance of primordial mammals in southern Africa and their ichnology. Establishment of detailed stratigraphic zones in the Stormberg of Lesotho (southern Africa) (Upper Triassic to Jurassic). In: S. H. Haughton (ed. ), Second Symposium on Gondwana Stratigraphy and Paleontology, International Union of Geological Sciences. Council for Scientific and Industrial Research, Pretoria 343-370. Haubold H 1983. Archosaur evidence in the Buntsandstein (Lower Triassic) Acta Palaeontologica Polonica 28 (1-2), 1983: 123-132. Peabody FE 1948. Reptile and amphibian trackways from the Lower Triassic Moenkopi formation of Arizona and Utah. University of California Publications, Bulletin of the Department of Geological Sciences 27(8):295-468. This entry was posted in ichnite, pterosaur origins and tagged ichnite, pterosaur origins, Rotodactylus by davidpeters1954. Bookmark the permalink. Now what might that signify? Well, as in all digitigrade animals, including humans when standing still on their toes, the center of balance is over the toes, the only parts of the body in contact with the ground. If you’ll remember from the Jayne movies on YouTube of lizards moving at high speed they become digitigrade. Cosesaurus was digitigrade all the time, according to Rotodactylus imprints, which are occasionally bipedal. This is the transitional taxon that went bipedal, that ultimately gave us Sharovipteryx (a full time biped), Longisquama and pterosaurs, which were doing other things with their hands now that they were no longer used for terrestrial locomotion.